With the many Civil War sesquicentennial celebrations, an increased interest in reenactments, and battle site visits have been the trend. But even with the renewed interest in Civil War history, few are aware of the military prisoner-of-war camps. Matching Civil War battles and the establishment of the various POW camps, may assist the researcher in determining a Civil War soldier's last resting place. When it comes to military prisoner of war camps, the state of Illinois must be highlighted. Of the thirty one (31) Union military prisoner of war camps, four were located in Illinois. Camp Butler; Alton; Camp Douglas; and Rock Island. These four facilities held approximately 53,000 Confederate prisoners of war. There were more than 647,000 prisoners captured during the Civil War. Many were paroled in the field, but 215,000 Confederate soldiers (and citizens) were held in Union prisons; 26,000 died while being held. Of the 195,000 Union soldiers (and citizens) held in Confederate prisons, 30,000 died while imprisoned. 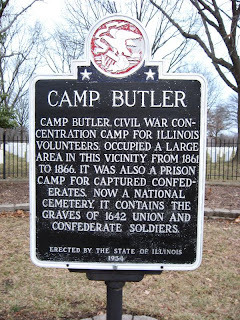 Camp Butler located in Illinois is about 5.5 miles from Springfield, Il in Sangamon County. Troops arrived at Camp Butler in August 1861. In 1862 Camp Butler, converted from a military training facility, began housing Confederate prisoners from the battle of Fort Donelson, TN. 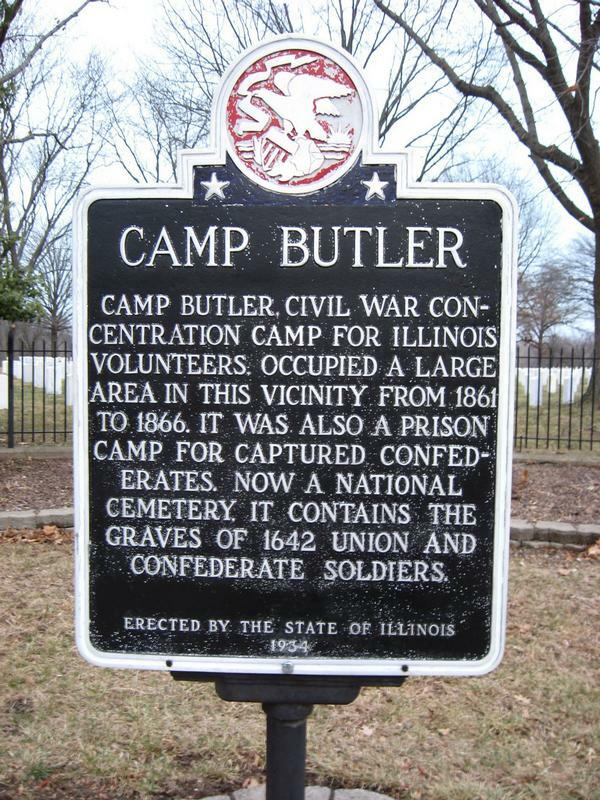 Camp Butler is the final resting place of 1,642 Civil War soldiers; 776 Union and 866 Confederate. During a smallpox epidemic 700 Confederate prisoners died and were interred. 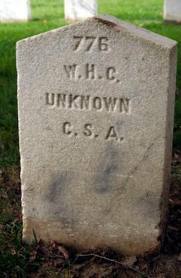 The Confederate graves can be distinguished by pointed headstones. Superstition states the pointed headstone is designed to prevent the Yankees (or the devil) from sitting on the Confederate soldier's headstones. Note: This National Cemetery is not limited to Civil War veterans. Today, over 18,000 tombstones are in the cemetery. For a listing of interred soldiers visit Interment.net. Roll of Honor of Burial Places o f Solders, Sailors, Marines and Army Nurses of All Wars of the United States Buried in the State of Illinois may be found at the Illinois State Archives microfilm 1956. Confederates are identified as Confederate, Rebel, or CSA. NARA microfilm, M598 - Selected Records of the War Department Relating to Confederate Prisoners of War, 1861- 1865. Captured confederate sailors information may be found in Microfilm Publication M598, additional information may be found on the NARA blog referencing: Selected Records of the War Department Relating to Confederate Prisoners of War, 1861 -1865. Record Group 109 and Descriptive Roll of Prisoners at Camp Butler, Il 1889 - 1904.